Gorgeous cards, Karen! I love how each card is so different to show the versatility of this great kit (and also shows your limitless creativity)! First thing that popped into my mind for the first card was WOW! Great card love the colors you used. Great job I like how you included the foliage with the 6x6 stamp. Great cards! I especially love the Backsplash dies. Awesome cards, Karen. I can see using the first two for Valentine's Day cards. Thanks for sharing! to pop them off the card. makes a great card too. Great cards, especially the keys. Love the collage feeling of your first card! Love the stain glass look on that last one nice idea! 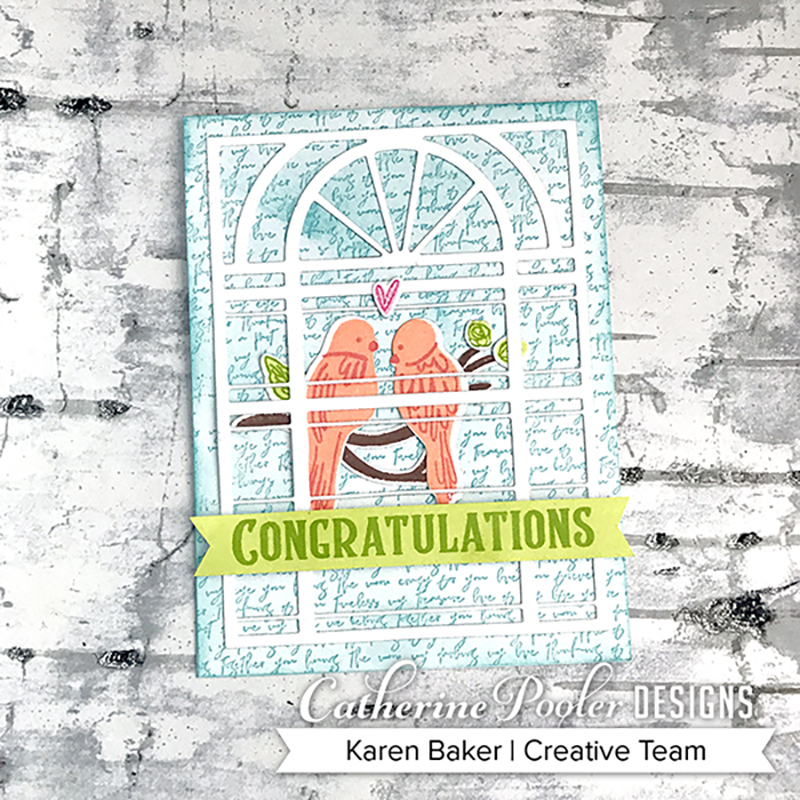 I like the dangling keys and those pretty love birds! 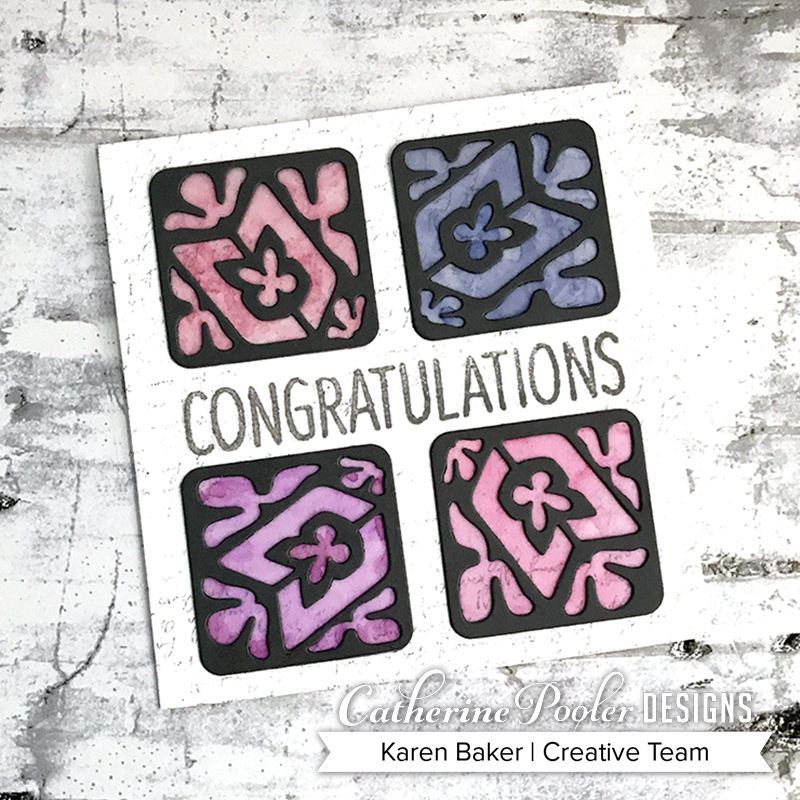 Wonderful cards Karen! Beautiful cards! Love the birds!! I'm loving all the cards on this hop so far! I really like your first one...I'm thinking I'll need to CASE that for a wedding I know about coming up this summer! Gorgeous cards! I absolutely love the first one!!! Lovely cards! Can't decide which I like best! These are ALL great cards! I am partial to the birds though...Thanks for giving us some inspiration! Ok really love your key card! I was on the fence about the keys, but this one won me over! Great cards! I really love the elements and layering on your first card with the keys and the background. 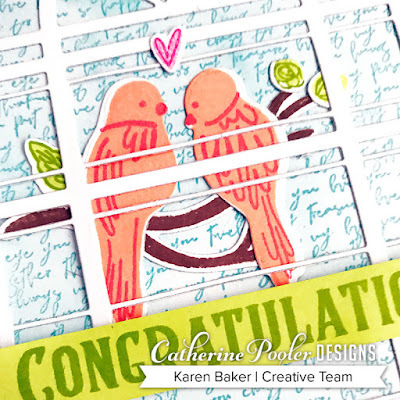 Beautiful cards.I love the birds. I love all of your cards, Karen but I adore the first one. Great cards! I love how the Love Notes Background stamp looks behind the Adore die. Can't wait to try it out! Fantastic cards! Love the first one with the keys. These are fabulous. You've got a stained glass window look for sure on that last one. These are all so pretty. I especially love the key/congratulations card. It's a beautiful design. I especially love the birds. They are simple, but so cute. I'm loving all of the depth worked into your cards! Especially that key card. Super cool! 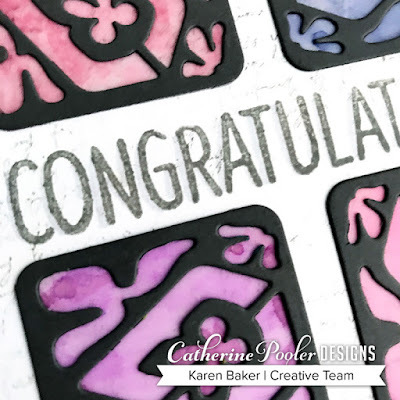 Love the card with the backsplash dies! Beautiful cards! I love what you did with the little birds! So sweet! 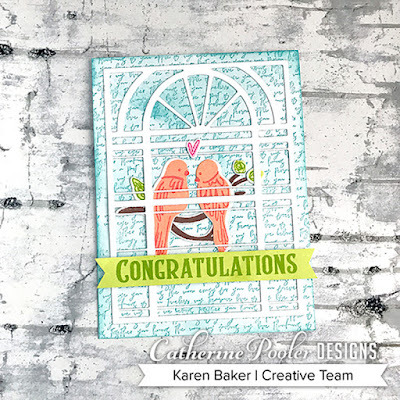 Karen, all of your cards are gorgeous; the first one is my favorite if I had to pick one!The back splash dies look like so much fun!! I love those birds. You made some amazing cards! Wonderful cards Karen. I love how you have showcased all the products. Wow! I am loving that bird card! So much detail and so pretty! Wow! 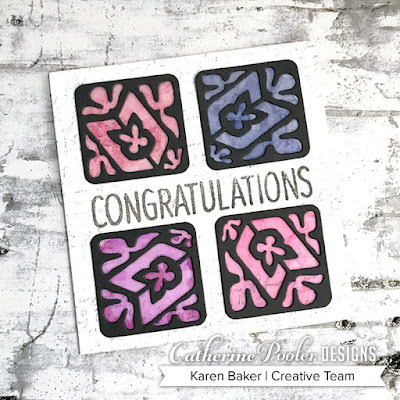 Beautiful cards, Karen and love the colors you have chosen just amazing. Who wouldn't fall in love with those cute little birds. Thanks for sharing and this is a great collection. These are really beautiful! :) My favorite is that first card you shared. Love the colors. Really love all of your cards! The first one though is my favorite. I love the light green you used here! Wonderful creations, Karen. I particularly love the clean vintagy look of the first card. The leaves are a great addition. I love the color choices. The dark green one with the hanging keys really is beautiful. I love the way it looks. BEautiful cards! Loving that background stamp! Lovely colors! Beautiful!!!! Thank you for sharing your creativity with us!!! Karen, your projects are beautiful! Happy New Year! Your last card is wonderful! I love the white and black with the splashes of color behind them. Such a powerful image! Beautiful cards! I love the window and birds! Your backgrounds are STUNNING! I love this release! FAbulous cards. Love the birds and the hanging keys. 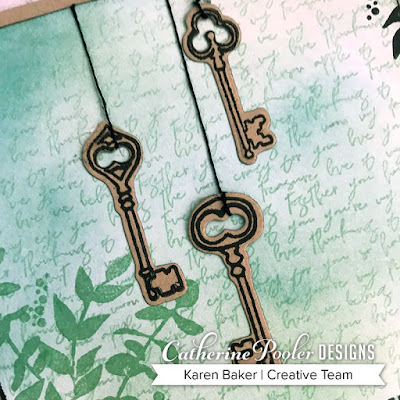 I love the hanging keys and the love note backgrounds. Gorgeous cards! Amazing layers of colors, textures and elements - fantastic!